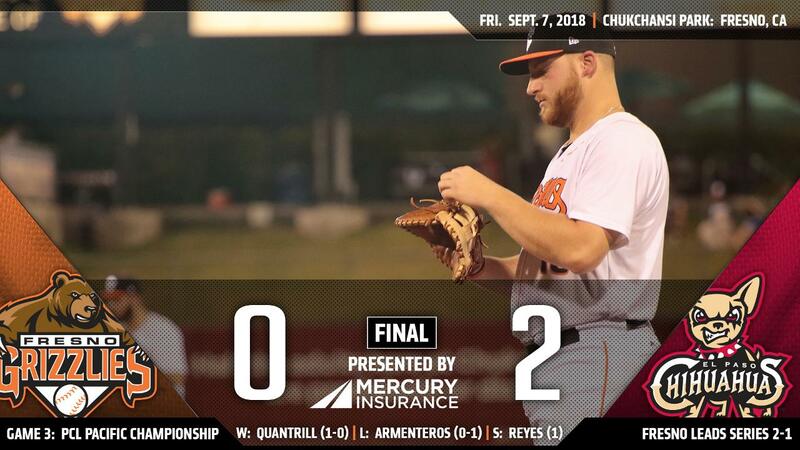 In front of a crowd of 9,902, the El Paso Chihuahuas (1-2) blanked the Fresno Grizzlies (2-1) 2-0 in game three of the PCL Pacific Championship Friday night from Chukchansi Park. With a chance of being swept and eliminated, the Chihuahuas staff buckled down and threw a three-hit shutout. Starter Cal Quantrill (1-0, win) stymied the Grizzlies bats for six scoreless innings. He allowed two hits and a walk while striking out seven over 88 pitches. Kyle McGrath and T.J. Weir followed Quantrill by hurling a perfect seventh. Then, Kazuhisa Makita worked two-thirds of the eighth before handing off the ball to Gerardo Reyes, who secured the save after one and one-third scoreless frames. With lights out pitching, El Paso only needed two runs to enjoy the victory. Allen Craig (1-for-2) supplied the offense when he doubled home a pair of runs in the top of the first. Forrestt Allday (2-for-5) and Carlos Asuaje (3-for-4) waltzed in to score on the play. Fresno righty Rogelio Armenteros (0-1) suffered the decision after six solid innings. He was charged with two runs (earned) on six hits, two free passes and seven punchouts. It was his fifth consecutive start fanning seven. The Grizzlies fell to 25-7 in his starts since he made his debut in 2017. Reliever Justin Ferrell mustered two and two-thirds of almost perfect baseball for Fresno in his Triple-A debut. He fanned a pair and walked one in his outing. Nick Tanielu and Yordan Alvarez continued their hit streaks on the night. Tanielu is at 13 games, a current team-high and Alvarez is at eight. Kyle Tucker also singled, reaching base via a hit in 13 of his last 14 contests. Both squads continue the PCL Pacific Championship series with game four Saturday evening from Chukchansi Park. First pitch is scheduled for 7:05 PT. Fresno RHP Cy Sneed (0-0, 0.00) and El Paso fellow righty Colin Rea (0-0, 0.00) are the probable matchup.